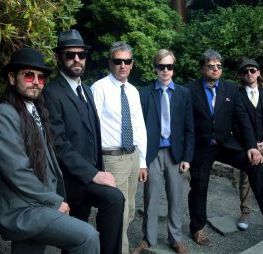 Since the band’s conception in late 2004, The Georgetown Orbits have risen to international notoriety for their soulful, modern-vintage, style of Jamaican ska, reggae, and rocksteady music. Multiple releases from the critically-acclaimed group have earned ample airplay on radio stations and podcasts all over the world. The band is well-known for their dynamic musicianship. The authentic feel they bring to their music has attracted audiences all over the western US and Canada. The band’s 4th full-length studio release ‘Solar Flares’ is the pinnacle of the Orbits keen songwriting and performing aptitude. It is an inspired collection of mostly original compositions with a sprinkling of classic Jamaican covers that lends a strong hand in charting the course for modern-vintage music while paying tribute to the magnificent sound of the roots of reggae and ska.